Metro, one of the leading retail companies in the Philippines, is set to celebrate 35 fruitful years of good finds, awesome deals, and best prices with an all-out sale at up to 50% off on storewide selections this October 13, 14, and 15. Arthur Emmanuel, President and COO of Metro Retail Stores Group, Inc. comments, "This Anniversary Sale not only commemorates our 35th year of service, it also marks our success, standing at the forefront of the retail industry, serving an average of 250,000 shoppers per day." With over 52 stores nationwide, Metro Retail is proof that a good name built on hard work and trust, coupled with quality products and excellent service, wins a customer’s loyalty. Metro’s premium merchandise goes on a storewide SALE, with up to 50% off on all items as part of its anniversary celebration. Shoppers can purchase the freshest produce, stylish homeware, limited edition products, and the hottest fashion finds at discounted rates. 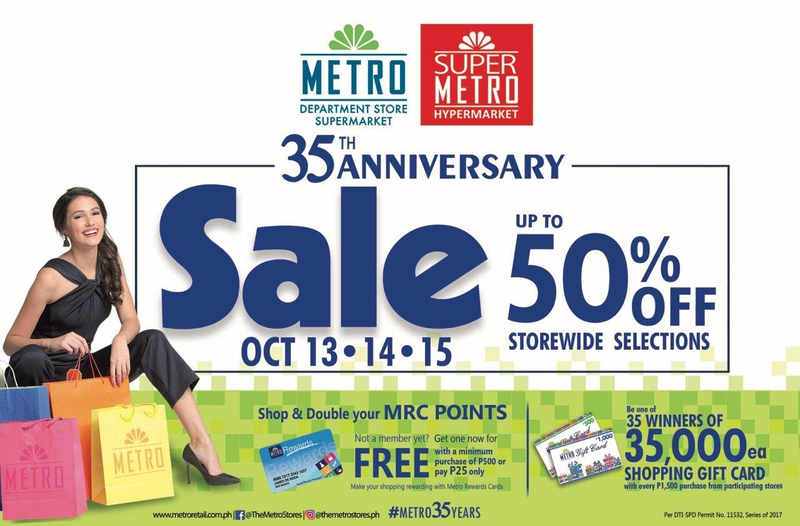 Metro’s 35th Anniversary SALE will also award 35 lucky shoppers with 35,000 worth of gift certificates. "Expect only the best bargains here at Metro, as we renew our commitment to offering the best value for your money, while constantly improving your shopping experience – making it more convenient, affordable, and worthwhile," Emmanuel adds. Head to the nearest Metro Department Store, Metro Supermarket, or Super Metro Hypermarket from October 13 to 15 for an anniversary sale that celebrates 35 years of great deals at super reasonable prices.